All college students in one Canadian province will receive access to Lynda.com courses. The Ontario government has signed an agreement with LinkedIn, a Microsoft company that owns Lynda.com, to provide skills training through LinkedIn Learning that will help post-secondary students "prepare for the jobs of the future." The arrangement applies to more than a million learners, including faculty, in all 44 universities and colleges in the province. It came about through a collaboration involving LinkedIn, eCampusOntario and Ontario's Ministry of Advanced Education and Skills Development. Under the program, faculty will be able to "flip" their classrooms by pointing students to courses and videos that align with their learning objectives. The online courses, which tend to focus on the newest technologies and skills, are also expected to help instructors stay up-to-date with their own training, especially in IT areas. 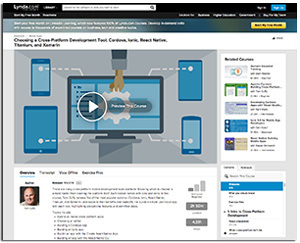 LinkedIn is in the process of mapping Lynda.com content to specific skills and competencies making up course curriculum. That mapping is intended to help faculty as they assign videos to their students. The work will also help schools stay on top the most in-demand skills, which LinkedIn tracks through its "Economic Graph," to provide updates on 50,000 job skills referenced in 10 million open jobs. "Today's announcement is very good news for our students and faculty members," said Patrick Deane, president and vice chancellor of McMaster University, in a public statement. "The expanded access to online learning content is a valuable complement to the high-quality teaching and learning that happens every day in our classrooms, labs and communities." Added Marilyn Herie, vice president academic and chief learning officer at Toronto's Centennial College, "LinkedIn's access to a global community of subject experts and working professionals allows students to tap into a world of knowledge to support their individual career goals." The new program will help people "identify the skills they need to create new pathways to opportunity," said Mitzie Hunter, minister of Advanced Education and Skills Development, in a public statement. "By working in partnership with both eCampusOntario and Lynda.com, we are excited to offer flexible online learning that will build Ontario's talent advantage and help post-secondary students prepare for successful careers in this changing economy."